During the past month, our TheraPaws dogs have paid special visits to Audible, Buzzfeed UK and Channel 4; as part of a corporate stress prevention drive inspired by World Mental Health Day 2018 and National Stress Awareness Week. Staff at each organisation were invited to join a 90 minute drop in session at each of their offices, hosted by up to four TheraPaws dogs and their volunteer owners. Attendees had the opportunity to play with, stroke, cuddle and watch the dogs, activities which are all believed to lower general stress and anxiety levels and boost mood. Interacting with animals is widely considered to be beneficial for humans’ mental health, with multiple psychologists agreeing that dogs offer a similar kind of emotional support as people’s family, friends and loved ones. Crucially, animals also play the part of a non-judgemental third party, which leads to humans feeling happier, calmer and more in control when they are around dogs – and it is understood that spending even a short amount of time with a dog can improve social, cognitive and emotional functions and offers a pleasant and positive distraction away from a specific stress or worry. In a busy and high-powered environment such as the workplace, animal therapy can therefore provide an invaluable place of support for employees who might feel stressed or worried, and who are unable to express these feelings amongst colleagues for any reason. Attendees at our TheraPaws session at Audible expressed similar sentiments, saying: “This has really brightened up my day! Seeing dogs mess around being happy makes me feel happy.” An employee at Channel 4 added: “I have been working here for 10 years and this is the best day I’ve ever had”. Our TheraPaws dogs are usually engaged in attending day care and residential homes, hospitals and hospices across London; and specialise in visits to elderly patients with dementia and palliative care units. We are proud to play our part in boosting the general well-being and productivity of corporate teams such as Audible, Buzzfeed and Channel 4 as well as making a real difference to those with debilitating conditions; and in return for a donation to Mayhew, our volunteers and their dogs are available to help more staff all over London de-stress. 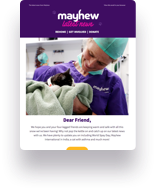 If you are interested in organising a corporate TheraPaws visit in London, please click here for more information.